I am joining Teaching Trio for Technology Thursday. I have had a wonderful time at TETA. I've learned so much this week and I still have one more day. I wanted to share a few apps that I was introduced to today! The first app is called AR Flashcards. They have a couple different paid versions, but the Alphabet version is free! I found this awesome video that shows what this awesome app does! This new kind of technology is called augmented reality. If you search the App Store you find various types of augmented reality apps. Another awesome augmented reality app works with the 2013 and 2014 Guinness World Record Books! The Guinness World Record App is free, so you only need to pay for the book. computer you can then transfer the scores to your grade book with the touch of a button! The app is free for up to ten question quizzes. You can upgrade for up to 100 question quizzes. I really love the reports that are available. I love data and this provides lots of data. The view of the awesome data that is provided. All kinds of reports are available. Check out the awesome resource here. I hope you find something you could use here today. 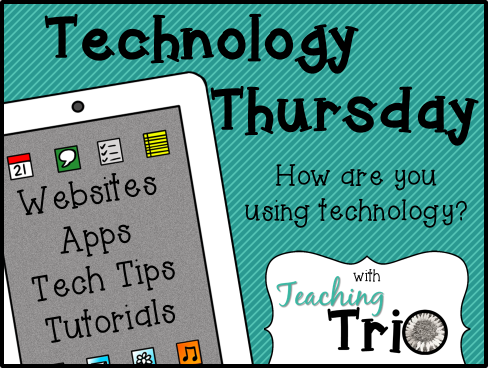 Be sure to stop over at Teaching Trio to check out other technology ideas.